Brazilian forward Neymar faces a fraud trial in Spain in connection with the value placed on his 2013 transfer from Santos to Barcelona, the Spanish National High Court said on Thursday. The defendants in the pending trial are the player, his parents, the two clubs, current and former Barcelona presidents Josep Maria Bartomeu and Sandro Rosell, and former Santos president Odilio Rodrigues, according to a court statement. The case stems from a complaint by DIS, a Brazilian company that owned 40 percent of the rights to Neymar when he was at Santos. It argues it lost out on its rightful cut from the transfer because the true value of the deal was understated. Prosecutors said in November that Neymar should be fined 10 million euros (8.5 million pounds) and handed a two-year jail sentence. For first-time offenders in non-violent crimes, sentences of two years and under are suspended in Spain and it is unlikely the player would serve any prison time. 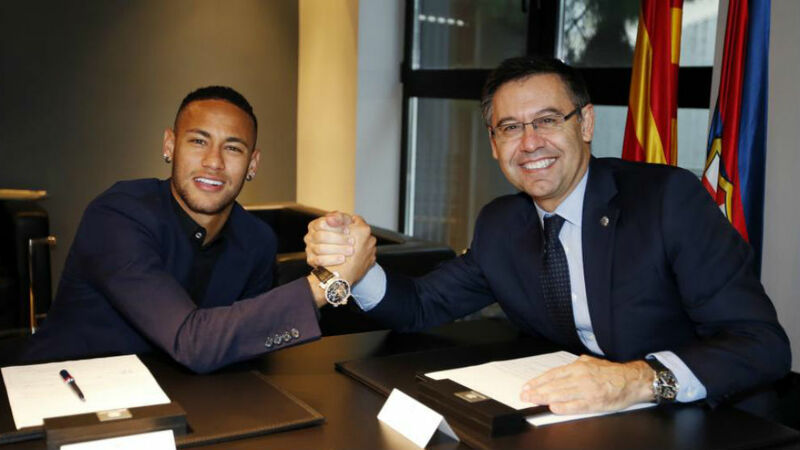 Barcelona said at the time of Neymar’s move that the transfer figure was 57.1 million euros, of which 40 million was paid to Neymar’s family. DIS received a 40 percent share of the remaining 17.1 million that was paid to Santos. But the court put the actual value of the rights to the player that were transferred to Barcelona at 25.2 million euros, and said DIS’s cut should have been based on that amount. “The Judge has set bonds of 3,429,768 euros as pecuniary liability for Rosell, Bartomeu, Rodrigues, Football Club Barcelona and Santos Football Club, which must be paid by all jointly,” the court said in a statement. Barcelona did not immediately respond to an emailed request for comment. No one picked up the phone at Santos or at Neymar’s Brazil-based company, NN Consultaria, when Reuters called seeking comment. The transfer has given rise to several investigations in Spain and Brazil. Last June, Barcelona agreed to pay a fine of 5.5 million euros to the Spanish authorities to settle a related tax fraud case.